A number Donne’s poems are formally titled Satyres, although in this chapter we are not going to restrict ourselves to them. 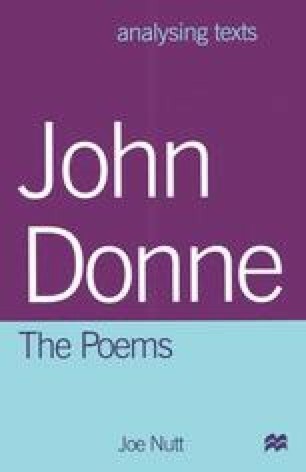 Many other poems freely employ satire and this should not surprise us given that Donne was an ambitious young man, restrained by his religion inside circles he could not quite break until he turned his back on his Catholic faith and embraced the Church of England. The poetic satire was a recognised method to draw attention to oneself. Circulated in manuscript amongst friends and potentially useful acquaintances, it was often the means to further a court career. Donne employed it in this way, and the Satyres themselves belong to the period of his twenties when he was at Lincoln’s Inn and eager to find a place in the world. They are his earliest poems and exhibit clear signs of frustrated energy and ambition. Satire is naturally the preferred method of the young. It is easier to expose folly in others when one has had precious little time for folly of one’s own. The first poem we will look at under the satire mantle is the Song, ‘Goe, and catche a falling starre’, which is quoted in full. Its relative simplicity and brevity make it easier to deal with than the formal Satyres, and so a more encouraging place to begin.